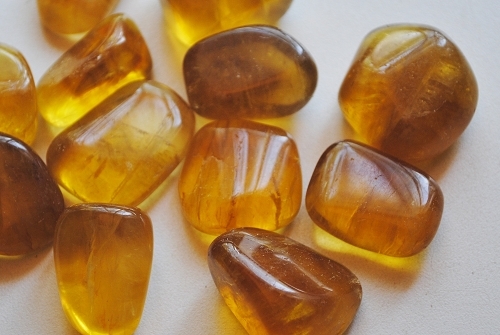 Yellow Crystals are invigorating and uplifting for the emotions. Yellow crystals have a nurturing and balancing energy alleviating hostility, irritability and melancholy. Interesting looking Natural Quartz Crystal Points “frosted” with butterscotch colored Chlorite from the Sweet Surrender Mine in the Ouachita Mountain area of Arkansas, USA. Bold patterns of golden yellow, chocolate brown and dark grey colors cover this beautiful Septerye Polished Egg from Madagascar, Africa. Natural creamy yellow and brown colored giraffe skin patterned Septerye Specimens from Utah, USA. Bright and sunny light yellow natural rough Sulphur in Quartz from San Felipe, Baja California Norte, Mexico. This beautiful golden hued Citrine Calcite natural crystal with flashy rainbow veils from Mexico is an energizing stone and may be helpful in attracting and connecting with people in friendship and business. Golden Citrine Quartz Cluster with honey colored crystal tips from Brazil. Beautiful translucent yellow brown colored natural Fluorite crystal from Purtee Quarry, Ohio, USA. Polished Fossilized Echinoid Sand Dollar Sea Urchin Shells from Madagascar. Beautiful ivory yellow colored natural Bamboo Agate specimen from Jawa Tengah, Java, Indonesia. Stunning translucent yellow Lemon Quartz Crystal Tumbled Stones from China. Beautiful mustard and brown colored dramatically patterned feather Jasper Tumbled Stone from Utah, USA.